Tibial tuberosity transfer (TTT), also known as the Hauser procedure, is generally performed on patients who suffer from recurrent dislocation of the patella (knee cap). The goal of this procedure is to tighten up the mechanism by which the knee is extended, improving the stability of the knee. 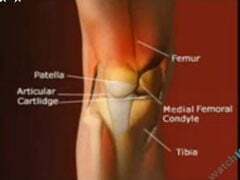 To perform the procedure, the orthopedic surgeon changes the placement of the patellar tendon, which holds the knee cap in place. To accomplish this, the surgeon affixes the tendon to a new point on the shin bone, using pins, screws, or a block of bone taken from elsewhere in the body. This help tighten the movement of the joint. TTT is generally considered in order to solve the problem it is intended to address — that is, the instability of the kneecap — but it often does not restore long-term function to the knee, because the tightened mechanism of the joint can lead to patellofemoral arthritis. The procedure is frequently performed under general anesthesia. Your surgeon will begin by making an incision in the front of the knee. Next, pins, screws, or a small section of bone will be used to help tighten the tendon. For example, your surgeon may make two small slits in the shin bone, then wrap the tendon around a screw and insert it into one of the slits. This will tighten the tendon and improve the stability of the knee. There are also other means by which your surgeon may achieve this objective: you should feel free to ask about the details of the procedure. After the procedure, you are likely to spend some time in the hospital. You will likely be groggy and "hung over" from the anesthesia for the first few hours after the procedure. Some modified TTT procedures can be done on an outpatient basis; others require a hospital stay of a few days. After the procedure, the joint will be immobilized, either with a cast or an immobilizer. You will be asked to stay off it for a few weeks (the amount of time varies considerably, so you should be sure to talk to your physician about it). While you are recovering, you will be asked to keep your knee iced and elevated. Your surgeon may also prescribe pain or anti-inflammatory medications. You may also require a few weeks of physiotherapy after your operation. Your recovery will depend largely on your particular situation and the operation which you are undergoing, so be sure to ask your orthopedic surgeon what you should expect. Talk to your doctor about the specific benefits and risks of the procedure for you, and about how to manage your recovery process.